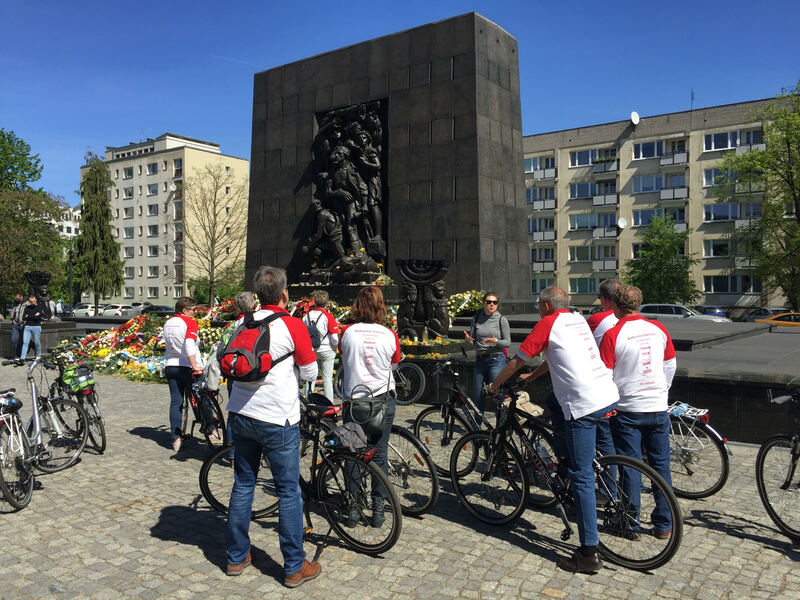 I have always liked riding a bike and, as the number of cycling routes in Warsaw has grown, I have decided to add a bike tour to my offer. There is no obvious itinerary for a bike tour in Warsaw. I chose to divide the tour into two parts. We start right in the centre, in front of the Palace of Culture and Science. That’s a good starting point cause everyone is curious what this creature is and that’s where you can explain it all. From there we go towards the area where the Jewish ghetto was during WWII. Apart from telling the history of the ghetto I always make sure to tell the stories of people who lived there at those times and are somehow related to the history of Warsaw. Just to mention Janusz Korczak, Irena Sendler and Władysław Szpilman. We finish the Jewish part of the tour at Umschlagplatz, the monument commemorating 300.000 Jews taken from Warsaw ghetto to Treblinka extermination camp. The second part of the tour starts in Krasińki Garden where we can explore the green area of Warsaw. It’s one of those parks where on a sunny day you just want to lie down and relax. Watch out for running children and dogs! Once we pass the Warsaw Uprising monument, we enter the Old Town where the cobblestones make the ride less comfortable. Here, however, on a busy day we must simply walk with the bikes. There are lots of spots to notice and loads of stories to tell so no reason to be hurry. Once we reach the Royal Castle we always take a moment to enjoy the view. Check if the King on the column still keeps the sword up! The Royal Route during summer weekends is closed for traffic and much more enjoyable for cycling than during weekdays. We give a look at the Presidential Palace and move towards the Tomb of the Unknown Soldier. Don’t be surprised if you hear some Chopin’s music on the way. The playing benches appear here and there to discover what the famous composer had in common with the place.